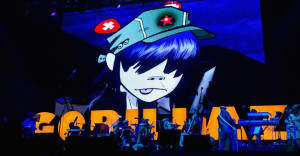 The Humanz track gets a pulsing beat from the NYC producer. The Gorillaz are readying the release of their long-awaited album Humanz next week, but before they do, they're sharing a remix of one of their new songs "Saturnz Barz," which features killer vocals from Popcaan. The remix comes courtesy of Aa and "Harlem Shake" producer Baauer who takes the ethereal track and adds a serious sense of dread to the proceedings. Humanz finally arrives on April 28.